The Opium Wars, also known as the Anglo-Chinese Wars, divided into the First Opium War from 1839 to 1842 and the Second Opium War from 1856 to 1860. These were the climax of disputes over trade and diplomatic relations between China under the Qing Dynasty and the British Empire. The import of opium into China stood at 200 chests (annual) in 1729, when the first anti-opium edict was promulgated. This edict was weakly enforced, and by the time Chinese authorities reissued the prohibition in starker terms in 1799, the figure had leaped; 4,500 chests were imported in the year 1800. The decade of the 1830s witnessed a rapid rise in opium trade, and by 1838 (just before the first Opium War) it climbed to 40,000 chests. Considering that importation of opium into China had been virtually banned by Chinese law, the East India Company established an elaborate trading scheme partially relying on legal markets, and partially leveraging illicit ones. British merchants carrying no opium would buy tea in Canton on credit, and would balance their debts by selling opium at auction in Calcutta. From there, the opium would reach the Chinese coast hidden aboard British ships then smuggled into China by native merchants. In 1797 the company further tightened its grip on the opium trade by enforcing direct trade between opium farmers and the British, and ending the role of Bengali purchasing agents. British exports of opium to China grew from an estimated 15 tons in 1730 to 75 tons in 1773. The product was shipped in over two thousand chests, each containing 140 pounds (64 kg) of opium. British military superiority drew on newly applied technology. British warships wreaked havoc on coastal towns; the steam ship Nemesis was able to move against the winds and tides and support a gun platform with very heavy guns. In addition, the British troops were the first to be armed with modern muskets and cannons, which fired more rapidly and with greater accuracy than the Qing firearms and artillery, though Chinese cannons had been in use since previous dynasties. After the British took Canton, they sailed up the Yangtze and took the tax barges, a devastating blow to the Empire as it slashed the revenue of the imperial court in Beijing to just a fraction of what it had been. 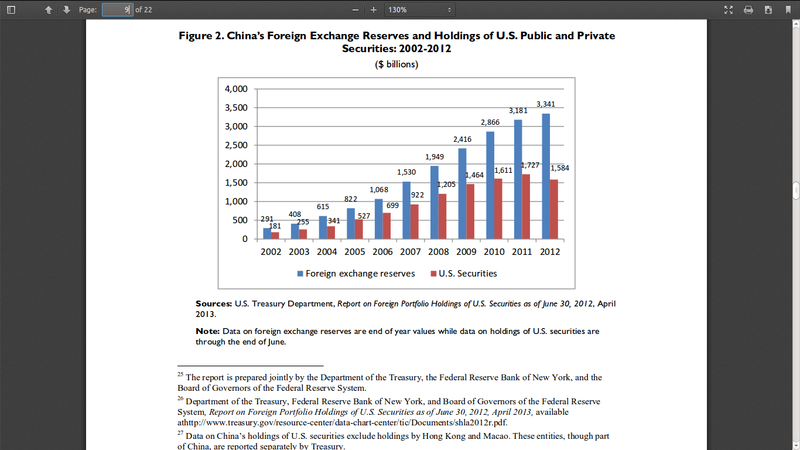 Notice how Chinese purchases of US Treasury mirror the rise in Opium purchases. It offers a great opportunity for the US to virtually cancel the US debt into half, by going into conflict. The window of opportunity for US military superiority over China is limited- within a decade China would no longer be a generation behind US Aircraft Carriers. So the US might just make a huge profit because of the shutdown. Still think that Boehner is crazy?